The Poem Farm is taking an internet-free holiday through the New Year! Many joyous wishes to you and yours during this time of light. Students - Today's poem sprouted from something that happened last weekend. I don't even need to tell you what happened because the poem and the photograph above tell the whole story. We had such a good time at my mom's house, and you can see our two girls happily decorating. 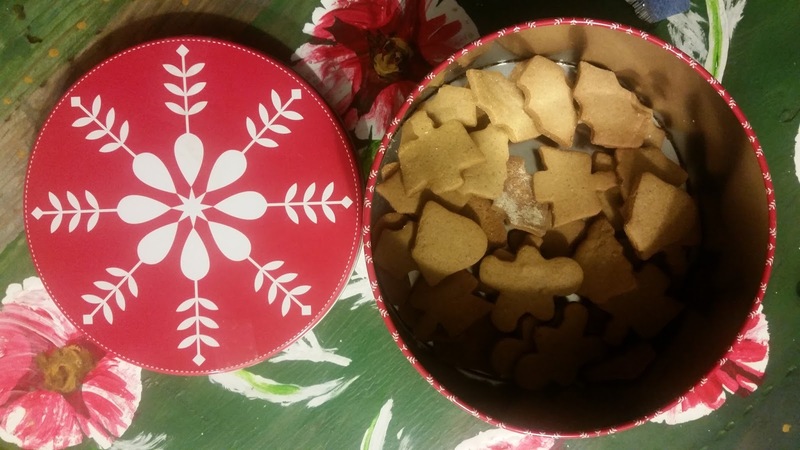 When I began writing toward this poem, my first words were inspired by the red tin of cookies sitting on our coffee table. I began writing about cookies whispering to me. Then I imagined that these cookies were the great-grandchildren of the famed Gingerbread Boy of storybook lore. And then I remembered last weekend. I remembered the giggles we all had over the two styles of cookie that our girls decorated together: one style by one sister, one by the other. Pay attention to when you laugh. In laughter, in family giggles, in guffaws and snorts...we discover the joyous poems of our lives. I wish you so so many good laughs this winter season! 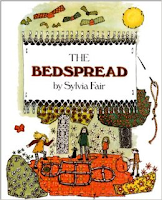 If you, like I, enjoy discovering old and wonderful picture books, don't miss THE BEDSPREAD by Sylvia Fair. Our youngest daughter's nursery school teacher recommended it to us as she had two daughters who were very different from each other...and we do too! Writing today's poem brought me back to this old favorite. Tabatha is hosting today's Poetry Friday party over at The Opposite of Indifference. Join her, and all of us, in finding goodness in poetry and life all week long. Everyone is always invited to Poetry Friday, and the tea is always on. LOVE the shark-toothed gingerbread! Also love the idea of a new generation of Gingerbread people and creatures. We are reading many versions of the Gingerbread Man right now and writing gingerbread-inspired stories. 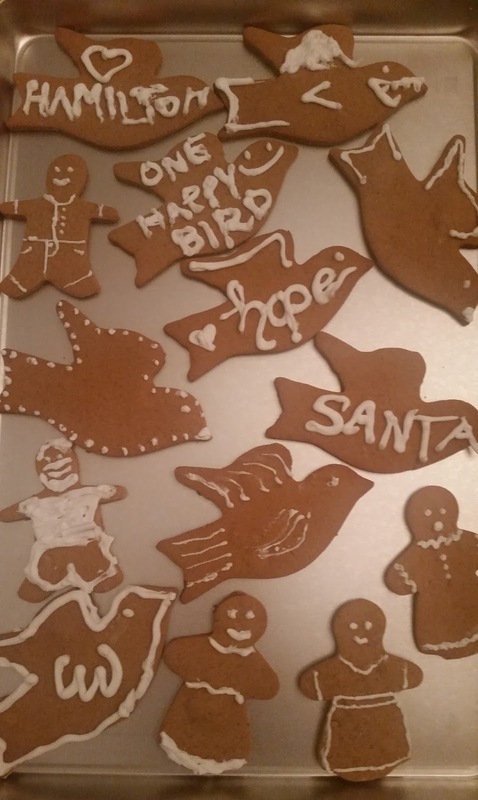 Gingerbread Grandchildren needs to be written! Oh what fun! 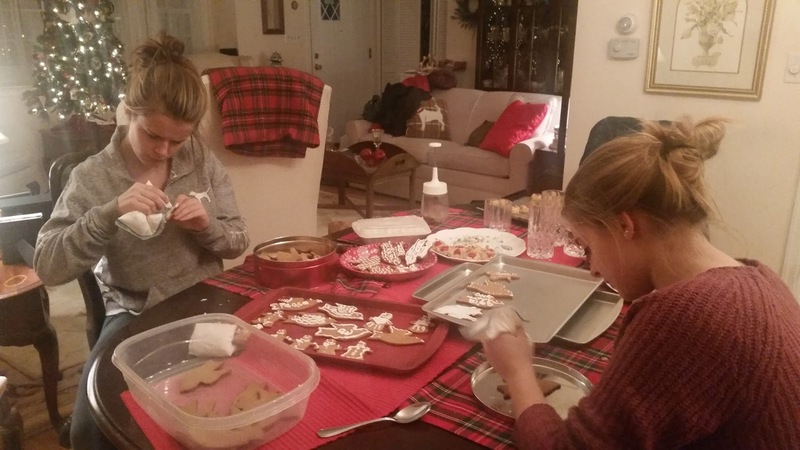 Decorating cookies with friends and family is such a wonderful tradition. Wishing you and your family a joyful holiday season, Amy. I usually bake by myself these days, but we had a cookie-making marathon with my nieces when they were in their early twenties. Such happy memories! Love your poem and photos! On Sunday, I will bake cookies for my class to decorate (for the more than 30th time). I'm sure we will laugh and laugh at their creative ways they decorate them! We are constantly surprised at how different from each other the grand-girls are, and it's quite wonderful too, to see your daughters show their uniqueness. Love that you captured this family moment, too, Amy. Happy Christmas to you and the family! Love all the different cookies, especially the heart hamilton. I love the poem memorializing the doves and daughters. I absolutely love the idea of gingerbread doves singing a cinnamon song - wonderful line! A lovely poem to remember a holiday tradition. I am so touched by your poem, "Xenophobia." It's says it all beautifully. Why does it take so long? I could smell the cinnamon in your poem and taste the laughter.